1. Flexibility: 100m Long distance control machines. Tips: Safety distance less than 10m. 2. Use friendly: 25 degrees climbing ability. 3. Intelligent Remote control and auomatic walking. 4. Efficiency: Patent Planetary Rotating System. Scratch patterns genetrated by the four heads planetary rotating grinder. 5. Precise and Durable: Gears driven. The gear driving is very precise like a Rolex watch. Dust- Proof and water- proof of the gearbox. Warranty for 3 years (gear). 6. Operability: Rear Position - Used for tipping the machine to make tool replacement easier. Working Position - Used when operating the machine manually or via the remote control. Packing Position - Used for transporation as the machine takes less space. 7. 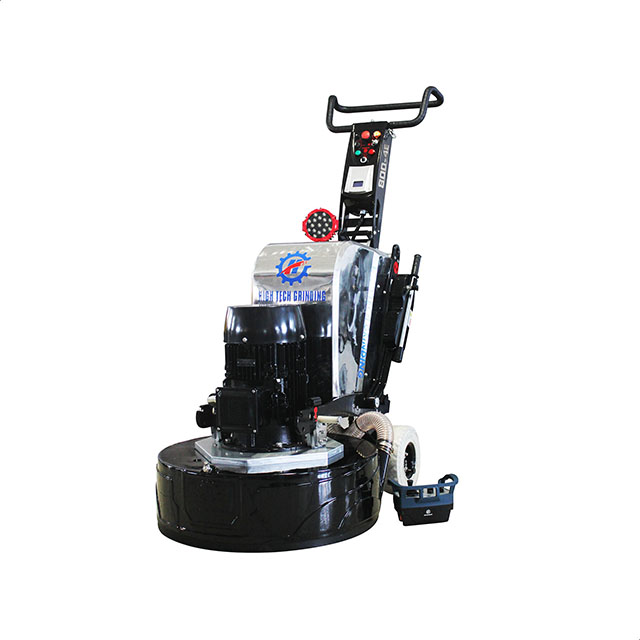 Dust Skirt: The dust cover will not fall off the machine, which solved the traditional grinding problem of re-installing the dust cover then to improve the efficiency from details. 8. Driven motor:Imported from Germany. High Quality with three year warranty. 9. Achieve CE and US standard Electrical Control Design: Good cooling effect, high dust-proof function and longer lifespan of the machine. Multifunctional Abrasives: High Tech Grinding 800-4E with unique and patented multi-functional abrasives.